"Marine Boy" tells the story of a former swimming athlete ([Kim Kang-Woo]]) desperately in debt and because of this, becomes employed as a "body packing" drug mule by a heartless drug lord (Cho Jae-Hyun). 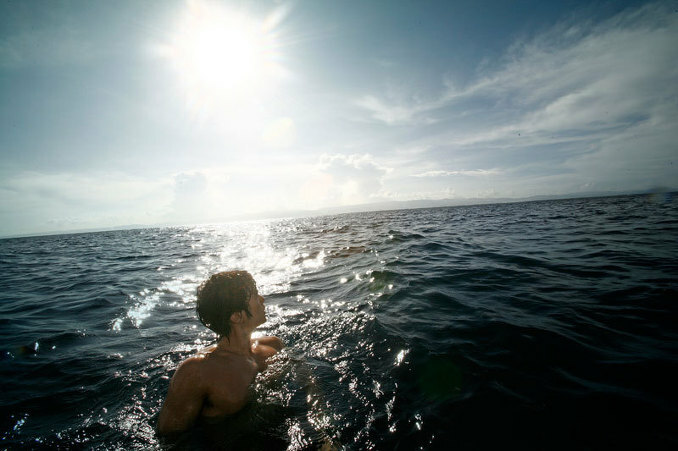 After swallowing a 10-meter-long drug package, "marine boy" must swim across waters between Korea and Japan. Among the many things that beckon death, an alluring beauty (Park Si-Yeon) tries to seduce him. The movie "Marine Boy" has no relations with Korean Olympic swimmer Park Tae-Han, who is also known as Marine Boy. The movie's title is derived from a slang word for underwater drug runners. Actor Kim Kang-Woo ate mostly chicken breast meat for 5 months to get in shape for the film. Ki May 30 2009 12:02 am “Marine Boy” is a new South Korean thriller that’s not a biopic on Korean Olympic swimmer Park Tae-hwan aka Marine Boy. Rather, the Korean film “Marine Boy” is an over the top action-thriller that will have you swaying between feelings of excitement and befuddlement. The film stars well chiseled Kang-woo Kim, gorgeous eye-candy Si-yeon Park (schwing! ), Jae-hyeon Jo, and Won-jong Lee (better known for his comedic supporting roles in films like “200 Pounds Beauty” and “Dasepo Naughty Girls”). The film is directed by newcomer Jong-seok Yun and if anything, his motto in the film seemed to have been “..everybody just go overboard!” (pun intended). Set in the port city of Busan, “Marine Boy” centers around Cheon-su (played by Kang-woo Kim), a swimming instructor that finds himself quickly drowning in a sea of trouble. He loses money that he doesn’t even have in a high stakes poker game. A few days later loan sharks come to inflict permanent damage upon Cheon-su. He is then saved by another group of criminals. The gang, led by Kang (Jae-hyeon Jo), saves Cheon-su to recruit him as their “Marine Boy” - a body packing drug mule required to swim across the ocean. Cheon-su reluctantly agrees to work with the criminal gang, especially enticed by Kang’s beautiful associate Yu-ri Choi (Si-yeon Park). Yu-ri has her own beef with Kang and attempts to use Cheon-su for her own purposes. Meanwhile, a narcotics agent (played by Won-jong Lee) tries to use Cheon-su as his own pawn to take down Kang. “Marine Boy” starts off on solid footing as a straight-laced cat and mouse thriller before stepping on the accelerator with the story becoming riddled with trickery, deceit, and manipulation from four different directions. With the script becoming ever more convulated, the actors turn up their performances by becoming increasingly over-the-top or hammy. Does all of this work? Hmmm … in a way it does, because you won’t feel bored for one minute, but then again, you probably won’t feel bored watching Siamese twins recite Shakespearian poetry in a freak show either. 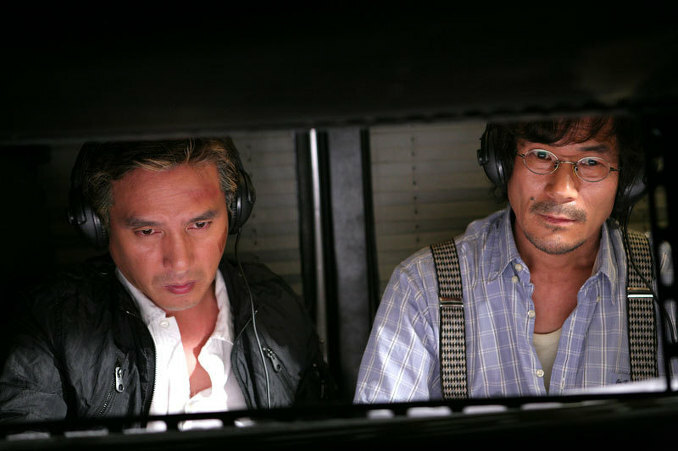 The person guilty of taking their character to comical levels of hamminess would lie with Won-jong Lee as the police detective. Perhaps if the filmmakers casted someone more familiar with strong masculine roles than the need to overact would have lessened. Adding more craziness to the film, “Marine Boy” at its most climatic moment turns into a Hitchcock inspired finale (visually speaking). In no uncertain terms “Marine Boy” is film that’s packed with excitenment, craziness, overacting, tension, and a level of unpredictability derived fairly or unfairly from a script that’s completely overbaked. Where else can you suddenly watch Si-yeon Park belt out a cringe inducing cover of “No More Lonely Nights?” Beneath all of this madness, “Marine Boy” does seem to have have a level of heart probably gotten from the pairing of Kang-woo Kim and Si-yeon Park. I like “Marine Boy” … just don’t tell anybody I said that.